Joseph Munene’s huge smile is a delight to see, but his story is sadly all too familiar. He was abandoned by his mother because he was disabled, and was found almost starved to death, dangerously underweight and suffering from severe malnutrition and neglect. Since then he has been cared for by his grandmother (Granny Munene), who loves him very much. He has gained a lot of weight and is making excellent progress through the therapy he receives at the Sanctuary. Joseph and his grandmother live in very poor conditions at the IDP (Internally Displaced Peoples) camp, which the team from Belfast visited during their trip to Kenya in September 2014. There are many displaced people at the makeshift camp, living destitute in shelters made from little more than plastic bags. For the past five years Joseph’s grandmother has shared a tiny, half-height shack with four other women, and Joseph often gets sick with the cold and the damp conditions at night. Joseph attends day care at the Sanctuary twice weekly which he absolutely loves, and his grandmother helps at the workshop those days which enables her to earn some much-needed money to feed herself and Joseph. Despite all the hardship they both endure Joseph is an amazingly happy and smiling child and his grandmother is tireless in her care for him. 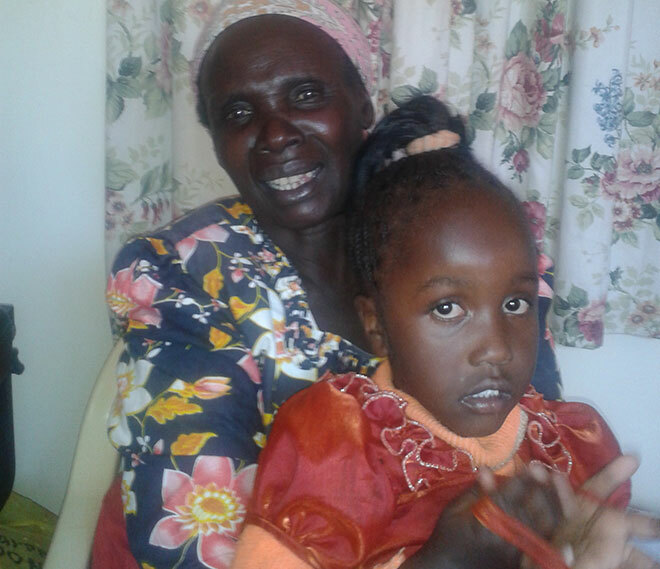 When one of our team commented on Granny Munene's strength as she put Joseph on her back to make the journey home from day care, she replied 'he is not a burden'. A lesson of love for all of us to learn. Kenuah’s appearance is undeniably shocking, but even more shocking is the reason he looks this way. We first got to know him in 2011. He had suffered severe burns after his mother, struggling to cope with his disability and her own alcoholism, attempted to kill him by pouring boiling water on him. Kenuah was treated at a local hospital where he was found by Terry Fairfowl while a team visiting from Belfast were decorating the walls of the burns unit, but after a time he was released back to his mother. Jason and Jolene Allen began a formal application to take full custody of Kenuah at the Sanctuary, and in 2013 this was realised. Kenuah became the first of two children to reside at the Sanctuary full-time in the new Rescue Centre; his mother has refused contact. This year he has gone through preliminary sessions of plastic surgery to improve the damage to his face, and this has gone smoothly so far. Kenuah has touched the hearts of all those who look after him. Despite all the horrors that he has been through, he is such a smiley child, and he makes the most of every experience on offer to him. Although Kenuah’s life has been changed by the love and care he has experience from the Befrienders, first through Terry and later through Jason and Jolene, he in turn has blessed all those he comes into contact with. He has been such an important figure for everyone at the Sanctuary for Sick Children. Kenuah’s experience is a shocking reminder of the stigma against disability which persists in parts of Kenya. Many disabled children suffer abuse or neglect as a result of this. Over time, we hope to see the work of the Rescue Centre expand, so that we can give refuge to more children whose lives are in danger because of how they are treated due to their disability. Your donations are vital to this project, and by helping us you can make a huge difference to these extremely vulnerable children. Nyambura came to The Sanctuary in 2010, unable to walk. Now she can not only walk, but run! Read this account of her incredible journey, written by Jolene Allen. They’re calling her the miracle child of Nyeri, and no wonder! Nyambura, now 4 years and three months old, is not just walking, but running alone without help, having previously never taken a step in her life. Video footage of the child walking for the first time has both astonished and encouraged those who have worked tirelessly with the disabled child. Abandoned at just seven months old, her mother dropped her off at her granny’s house, leaving her with only a small case full of clothes. When her granny returned home from doing chores she was shocked to find the baby there all alone and looking frail and malnourished. Nyambura had been left suffering from undiagnosed rickets, cerebral palsy, and was a poor feeder with recurring chest infections. Nevertheless just over three years later, with the help of her grandmother and the staff at the Metropolitan Sanctuary in Nyeri, Kenya, Nyambura, took her first authentic steps and is now said to be running up and down all by herself. A day in the life of Nyambura these days is doing things she might only once have dreamed of such as walking, climbing and running like any other able-bodied child her age. It’s a long way, of course, from those early, troublesome days, when her grandmother did her best to improve her condition, but without much success. Then at age 2 years old, divine intervention brought them both into contact with the Sanctuary and the rest is history. Belfast-based pastor, David Murray, who helps oversee the Kenyan ministry, commented “It’s a really great story of just how God can take a broken life and body and fix it and give hope where there was no hope. 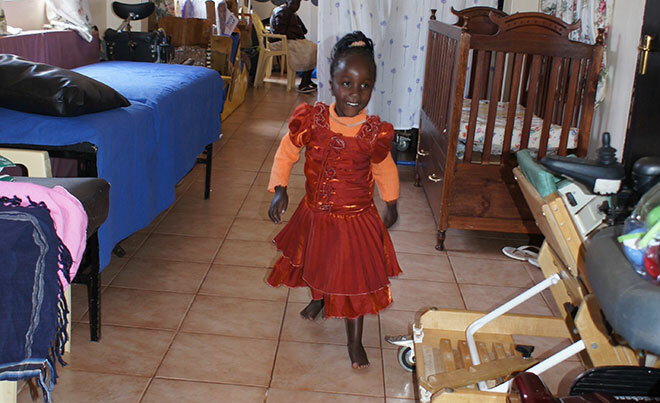 This little girl’s story is just so encouraging to everyone both inside and outside of the sanctuary in Nyeri”. Arriving unable to sit alone or walk, Nyambura’s back had developed a severe curvature which was very rigid and would barely move. She needed to be fed and dressed by others, and couldn’t talk. Her grandmother was so desperate she even asked the Sanctuary staff what her chances of survival were. The doctor prescribed calcium drugs after X-rays confirmed she had rickets. Nyambura immediately started attending the Sanctuary clinic for regular physiotherapy and occupational therapy to mobilise her back and it was from here that her recovery began in earnest. Her granny was encouraged to stay positive and to keep attending the clinic, and she was given a home program of therapy. Slowly but surely the rickets started to improve and Nyambura began to gain weight after she was provided with multivitamins from the Sanctuary which helped to boost her appetite and improve her health. After Nyambura had progressed so well in therapy, she was given a custom-made spinal jacket to correct the curvature of the spine and, importantly, her grandmother cooperated fully in ensuring that Nyambura wore it as prescribed. Jolene Allen, coordinator of of the Sanctuary clinic commented “She has worked hard and made immense progress, but the sight of her beginning to walk brought tears to the eyes of us all. It’s proof that the Lord is still doing great things and the Sanctuary is making a difference in the lives of children just like Nyambura”. Six months after therapy Nyambura sat for the first time on her own, which progressed to attempting to crawl, and, at the age of 4, she finally took those first steps with support. At this stage Nyambura no longer needed to put on her cumbersome spinal jacket, the job was done and her back was straightened. She stopped sitting in her cardboard chair which supported her to sit in a straight line; instead she was doing it on her own - check out the video below! Nyambura soon began producing words and short sentences, while her balance in stepping and walking continues to improve week by week. She can now feed herself independently, plays well and communicates excellently. A jovial and pleasant little girl, her supplements and calcium drugs were stopped and her regular visits to the doctor reduced and finally were deemed unnecessary. While the whereabouts of her mother remain unknown, Nyambura remains in great hands, the hands of her caring grandmother, the Nyeri sanctuary and, of course, the best hands of all, Almighty God Himself. To God be the glory, great things He has done! Joel is a 13 year old boy who has been attending our clinic for over four years. His mother abandoned him because of his disability, so he is brought to us by his grandmother who is his sole carer. She is an old lady, but amazingly she still has the stamina to put him on her back and walk with him to the bus to make a journey of 60km just to attend day care at the Sanctuary. Once there, Joel loves drawing, music, and playing with his friends. Joel is a bright boy and would love to attend school, but the ones near to his home cannot accommodate him because of his disability. At the Sanctuary, however, he has been given a spinal brace and an ACE cardboard support chair to help his back; this means that he can sit up unaided in his own home, which will help his digestion and his social interaction. He attends day care and makes the most of all the learning opportunities available to him there. Read this beautiful, personal account by Physical Therapist James Muriithi, who has been treating Joel at the Sanctuary. "It is dusk. The beaming radiance of the sun’s rays are slowly engulfed by the horizon. What a soothing beauty! And finally it’s over, a typical African sunset. Darkness creeps in, a cricket chirps, goats bleat their way back to their sheds. Within the confines of a mud walled house, someone is watching all of this unfold. Clinging tightly to his makeshift bed to shield himself from the evening chills, he lifts his head once more and peeps through the window as if to confirm that the sun has gone. That’s the best view he can get, half-seated with his hands propping him against the wall: if only he could stand and get a clear view of the sunset. But he can’t. His stiff legs fail him terribly and Joel sinks back onto his bed. For years, this bed has been his dining area, living room and his bedroom: his whole world. A few feet away from his bed a pot sits on three stones. Something must be boiling, perhaps arrowroot. A silhouette appears in the glow emanating from the kerosene tin lamp as someone enters the house. Meet ‘Cucu wa Joel’ (Joel’s granny), a woman who seems to have the stamina of a much younger woman, despite the deep wrinkles of her face. To Joel, she is mother, caretaker, sister, cook… absolutely everything. ‘Cucu hinga ndirica, kuri na heho...’ (‘Grandma, close the window, it’s getting cold...’), the boy asks. The hinges scream in protest as she slams the window shut. What a relief, but it’s not for long. Soon the room is filled with smoke that is emanating from the fireplace. Coughing begins, and ‘Wooooi cucu Ndogo!’ (‘Grandma I’m choking from the smoke!’). So the window is opened again. In a while a meal is shared, and Joel slowly but surely feeds himself bit by bit. A little spill here and another one there as he scoops the food off the bowl with his hands and then he’s done. It’s time to retire. Outside, through the worn iron sheeting, Joel can see a little light from the crescent moon. This is no ordinary evening for Joel, it’s the night before a day full of joy. Early tomorrow morning he’s going to be travelling to The Metropolitan Sanctuary, and he’s so excited. That’s the place Joel gets to meet all his friends, get a chance to play and learn to scribble as he attends his clinic. Given that there’s no clock and no cell phone, he himself is the alarm. A wink of sleep too long and they’ll miss the bus. As his grandma snores deeply, Joel has stretches of wakefulness He can’t wait for daybreak. At around 5.30am some hooting is heard from afar. ‘Cuucu!!! Cuucuu!! !, kirathimo ni njuku’ Joel loudly shouts at his to grandma to waken her. In this village there is only one bus that snakes along the dusty earth road in the early hours of the morning. Everyone who needs to get to Nyeri town has to catch it or else they are in trouble. The bus is named ‘Kirathimo’, which in the local dialect means ‘Blessings!’. Saying that this bus is a real blessing is an understatement. Joel is sandwiched between his grandmother and another elderly lady who smiles at him as she struggles to balance the basket on her lap that is loaded with arrowroots. She must be headed to the market. Both ripe and raw bananas precariously dangle from the roof of the bus and with a bumpy road to beat uphill, a first-time passenger might become worried about their safety... This is just the beginning of a regular 60km journey for Joel and his grandmother. Travelling over ridges, bends in the road, a valley and another uphill climb they proceed through the now patched-up roads that once upon a time had tar on them. The numerous ‘pick up and drop off’ stops that the driver makes seem to bother no-one. The passengers are deeply absorbed in lively conversations on various issues and as long as ‘Kirathimo’ keeps moving, nothing else really matters. Joel munches the ripe sweet bananas that his grandmother has carried along as he admires the tall buildings in the outskirts of Nyeri town… finally they arrive at 8am. The bus conductor helps them to disembark and someone offers to pay for their bus ticket. Wow, what a relief! Joel is put on his grandmother’s back she has to shove their way through human traffic along the busy streets of Nyeri town to get to the next bus stop. She pays her fare after undoing a big knot on an old piece of cloth that serves as Joel’s handkerchief and their de facto wallet. Joel is literally rocking on his grandma’s back with joy, nearly knocking both of them down upon seeing the signpost on the road that heads to The Metropolitan Sanctuary for Sick Children. He can’t wait to join the other children who, although they may have slight to severe physical and mental disabilities, can’t keep from smiling. Joel's grandma, despite being heavy-laden, paces on: this woman is full of love for her young grandson. Joel and his grandmother are the first clients to arrive and they rest at the waiting area. They have some porridge to calm their chattering teeth and warm their hands which are numb thanks to the morning chills of the Kenyan winter. For Joel it’s then time to catch up with his crayons and colouring papers with a glance every now and again at the children’s sing-along DVD that’s playing in the background. The day grows warmer and his legs become less stiff. His grandmother is narrating their epic journey to the Sanctuary to anyone who cares to listen. And who wouldn’t listen to this captivating woman who beats all the odds in life just to ensure that Joel is here to benefit from the services offered at this facility. Joel is examined at the clinic and he keeps his calm and flashes his smile at the slightest provocation. A few consultations with specialists and it is concluded that his hip, which is constantly painful because of a dislocation, needs to be treated and also that medication is necessary to manage this condition. He will have to attend intensive therapy sessions to improve his stiffening joints and help him become more independent. His ‘crooked’ back that has been deformed by his poor posture and prolonged sleep in one position will also be corrected by making a spinal brace for him, as well as a customised chair made of recycled cardboard and old newspapers in the workshop. When this has been made, the team will organise a follow-up visit at his home to deliver it. Back at the day care centre, he freely mingles with other children as they engage in sensory play sessions where they get an opportunity to experience the touch, sound and smell of different objects. The ever-smiling team at the day care facility helps the children to build their potential through simple play tasks, stimulation and group activities which make it all fun. Joel is so absorbed in this that he hardly remembers that the bus might be leaving town for the village soon. After lunch, both Joel and his grandmother enjoy the breeze sweeping across from the Nyeri Hills outside at the resting park. Moments later, both of them are spotted taking a nap on the grass. The journey to get here is a great challenge and sacrifice, and the effects of their early start to catch the bus are taking a toll on them. Grandmother is very tired, but there is another journey back home ahead of them. The signal that they need to leave casts sadness on Joel’s face. He will have to leave his friends for another day. If only there were a rescue centre big enough to accommodate him, or even a school. That would spare the creaking bones of this woman, who once again has to lift the boy onto her back and pace her feeble steps to town to catch the village bus. That evening, Joel happily recounts his day at the Sanctuary. Another day dawns, and shouts of excited schoolchildren awaken Joel. He enviously watches them through his window as they walk to school: a bunch of them pass by, a pair walk along holding hands, a trio sing some happy songs. He stays propped at the window, watching until they’re out of sight. If only he could attend some school someday. But for now it remains just that, a mere ‘if only’. The supreme irony is that the school gate is adjacent to Joel’s home but because it is a mainstream school, they can’t admit him. His only crime is that he can’t walk! Days quickly roll by and the team from the Sanctuary pay him a visit. Today it’s a chance for them to take the very same journey that Joel takes every time he has an appointment. Not only does he get a chair that will help him sit up, but also a brace for his back. The fact that he can sit up outside their house and enjoy the warmth of the morning sun is incredible. All he had known before was a makeshift bed upon which he would prop himself to peep and watch the events of the day unfold through the window. 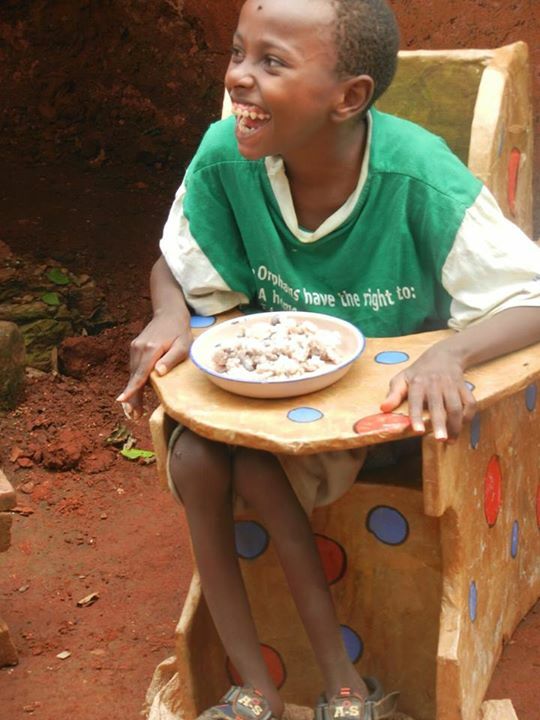 How wonderful that a chair made of what would otherwise be regarded as scrap can totally change the life of a child. Meanwhile his grandmother recounts her fruitless search for a school for him. Her enquiries at all possible schools have been met with excuses about the unavailability of places, or that Joel’s handicap cannot be accommodated there. She stares blankly, wondering when all this will come to an end. The fact that Joel's mother abandoned him doesn't help things either. And as the team leaves their humble dwelling, questions of whether children who share a similar plight to Joel’s will ever get a reprieve linger on. It’s dusk again, Joel watches the evening unfold as he sits on his new chair. Goats bleat their way back to the sheds, the night falls and Joel falls asleep, dreaming of his next visit to the Sanctuary and the day when, finally, he will be able to go to school at last."